The Berwick Waterways Precinct is located in Berwick. The precinct connects to the existing community via Centre Road, Homestead Road and Ward Road. The Melbourne Water retarding basin is located to the North and the Hallam Valley Contour drain is located to the west. The Berwick Waterways Precinct is a residential precinct. 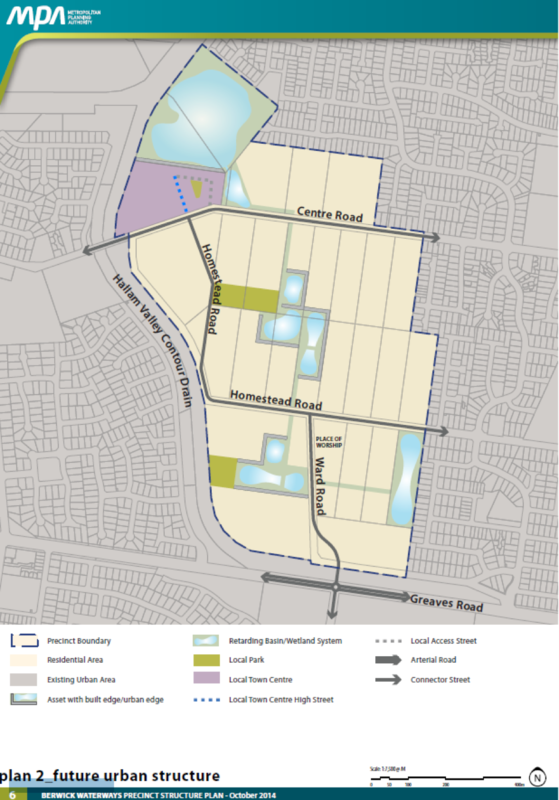 The main features within the precinct are the four distinct wetlands integrated with local parks. The Future Urban Structure Plan below demonstrates how the precinct will be developed over time. It identifies the location of roads, housing, employment and local parks. Access the full Berwick Waterways Precinct Structure Plan. Estimated number of local jobs - over 380 jobs. Infrastructure within the precinct will be funded by contributions from landowners. Access these documents from the Victorian Planning Authority website.